These terms encompass the loveliness that is The Dreaming Way Lenormand. The artist behind this deck is Kwon Shina who also created The Dreaming Way Tarot (US Games, Inc., 2012). The booklet is written by Lynn Araujo. 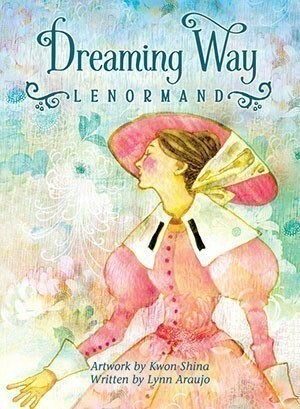 The Dreaming Way Lenormand is published by US Games, Inc. and retails for $15.95. It is packaged in a compact fitted box that measures 2.875 x 3.875.” The cards and booklet are typical playing card size, 2.5 x 3.5″ and fit nicely in the hand. They shuffle easily even for those of us with small hands. The Dreaming Way Lenormand consists of the traditional 36 cards that comprise a Lenormand deck. Card titles are traditional with the sole exception of Card # 22, typically entitled Paths, Roads, or Crossroads. Card # 22 represents being faced with a choice; therefore, for The Dreaming Way Lenormand this card is entitled, “Choices.” The card titles are presented in a small cream-colored block at the base of each image and are non-intrusive. The card numbers are presented in a small non-intrusive circle at the top center of each image. Playing card associations are not included on the cards, nor are they mentioned in the accompanying booklet. Kwon Shina’s watercolor paintings are conveyed with soft pastel backgrounds and vibrant foregrounds that help the center image of each card to look as though it is popping off the card. The watercolor medium lends itself nicely to the dreamlike quality of the imagery. The booklet by Lynn Araujo contains 91 pages and is the same size as the cards. The booklet and cards are housed together in the box with the booklet resting on top of the cards. The introduction briefly summarizes several deck reviews of Kwon Shina’s previous deck for US Games, Inc., The Dreaming Way Tarot and concludes with Lynn Araujo’s commentary about Kwon Shina’s artwork. The bulk of the booklet focuses on the card meanings. Card interpretations begin with a quote from various historical luminaries of their respective fields. The imagery is described and then the traditional interpretation of each card is presented. Card interpretations conclude with several keywords. The booklet concludes with a very brief summary of Lenormand reading syntax. Readers new to Lenormand will need to purchase another book in order to fully comprehend how to correctly read with the Lenormand system. One sample reading of five cards is provided. There is also a 10-card spiral spread that concludes the booklet, but it is not followed by a sample reading. The Dreaming Way Lenormand comes housed in a sturdy small box that is well suited for travel and will fit easily in a purse. I enjoy decks that travel well due to their compact and study packaging. Readers will enjoy The Dreaming Way Lenormand due to the soft dreamlike quality of the artwork that is presented with a great deal of charm. This is a lovely deck for beginners due to the charming simplicity of the images, but a beginner will also need to purchase a more in depth Lenormand book. I highly recommend Lenormand Thirty Six Cards: An Introduction to the Petit Lenormand, by Andy Boroveshengra. For those wishing to go truly in depth with their Lenormand studies I also recommend The Complete Lenormand Oracle Handbook: Reading the Language and Symbols of the Cards, by Caitlin Matthews. I received a copy from the publisher to consider for review. I only review those decks I feel make a valuable contribution and that I feel my followers will also enjoy. Previous Can Anyone Say “Mercury Retrograde Shadow Period”?